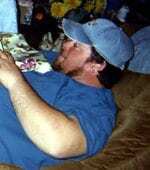 Jerry Lee Ingram, 46, of Dawsonville, GA passed away unexpectedly on Saturday, June 9, 2018 at his residence. He was born to the late Rual and Eunice Ingram. He was a life long resident of Dawson County. He loved to restore and collect old cars and hot rods, and loved to fish. He is preceded in death by his brother, Johnny Ray Ingram. He is survived by his brother, James Ingram of Dawsonville, GA; sister and brother in law, Shirley and Glenn McDaniel of Dawsonville, GA; and numerous other relatives and friends. Funeral Services will be held on Friday, June 15, 2018 at 2:00 p.m. at the Bearden Funeral Home Chapel, with the Rev. Casey Martin officiating. Interment will follow the funeral at Bethel Baptist Church Cemetery, Dawsonville, GA. The family will receive friends on Thursday from 5:00 – 8:00 p.m. and again on Friday from 12:00 until service time at the funeral home.